The St. Francis DeSales Athletic Department is excited to announce that Collin Palmer has been named the new Head Coach of the Wrestling Program, effective immediately. Dr. Doug Williamson was formally introduced as the Head Girls Soccer Coach at St. Francis DeSales High School this evening. REGISTRATION - The Stallion Summer League is open to boys entering Grades 5-9 in the fall of 2019. Cost: $175. The registration deadline is May 15th. MISSION AND HISTORY - The St. Francis DeSales High School Stallion Summer League (SSL) was started over 20 years ago by head coach and now principal, Dan Garrick with the intention of giving boys in central Ohio an opportunity to develop their basketball skills in an organized game setting. Although the games will be competitive and records will be kept, the absolute top priorities are for the boys to have fun, learn and improve. Dates for 2019 summer camps of 17 varsity sports are now available below. The St. Francis DeSales High School Athletic Department is committed to providing an exceptional camp experience for camper of all ages and skill levels. Campers will have the opportunity to learn more about their sport from St. Francis DeSales coaches and players to help campers improve their skills. We will also have a 2nd session from 3:45- 5:15 if we have enough demand for it. Cost - $50. Each Stallion Basketball Academy participant will receive a T-Shirt. The first 40 applicants to register will get a reserved spot. We will have a very good participant to instructor ratio. Students will be in groups of 6-8 per instructor. Payment is due by Wednesday, April 10. We will contact waiting list applicants after April 10. If we have enough people on the waiting list, we will open up a second session from 3:45-5:15 pm. New Albany won the 5th Annual Roosters Stallion Holiday Classic in the schools first appearance in the tournament. New Albany’s Josie Smith scored 25 points in the Championship Game vs. DeSales ranking 5th in tournament history among boys and girls; 3rd among girls only. The 69 points scored by the Eagles ties the boys and girls record for most points scored in a single game, and is the 3rd highest among girls teams only. For complete tournament records, click here. New Albany’s Olivia Gittens tied a girls tournament record for Most Points Scored in a Single Game with 22 Points. New Albany 60 POINTS SCORED AGAINST OLENTANGY ORANGE RANKS FIFTH MOST IN GIRLS TOURNAMENT HISTORY. RINGWOOD BECOMES THE FIRST INTERNATIONAL TEAM TO COMPETE IN THE ROOSTERS STALLION HOLIDAY CLASSIC. 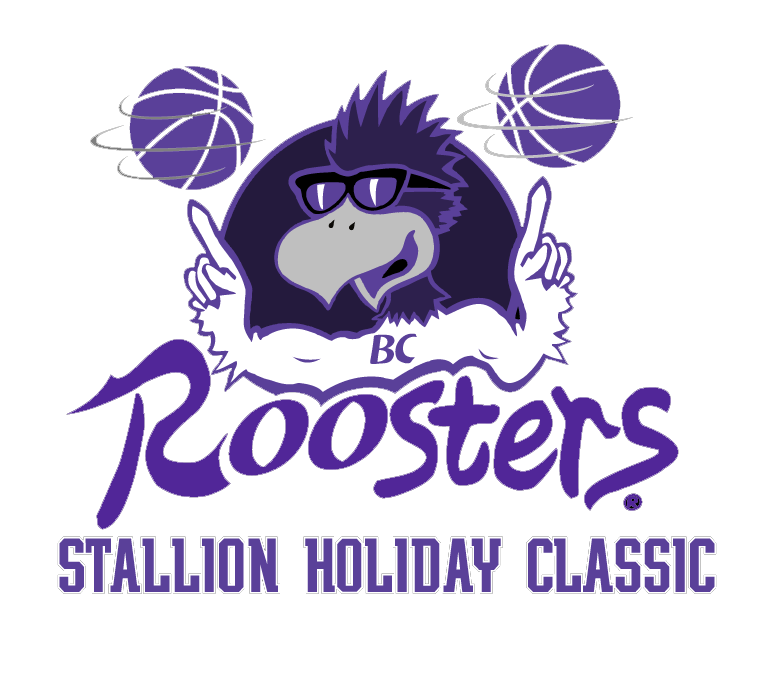 To view past results and the Roosters Stallion Holiday Classic Record Book, click here! Results from the 2018 Tony Pizzuro DeSales Wrestling Classic. Schedules for the 2018-19 Winter Sports Seasons can be found using the links below or by visiting the individual team pages. Changes to the schedules will be made as they are given to the SFD Athletic Department. A “Last Updated’ date can be found at the bottom of each schedule. Registration is open for Little Stallion Wrestling Club! Tickets are $8.00 presale and at the game. Pre-sale tickets will be sold all day on Tuesday and Wednesday (7:00am to 3:30pm) in the Main Office. Students interested in riding the bus to Xenia should sign up on the sheet located on the Main Office Countertop. the spirit bus is free of charge, but Students riding the Bus will be required to purchase a presale ticket. THE THIRD EDITION OF THE ST. FRANCIS DESALES MALE FALL SPORTS ATHLETE OF THE WEEK (9/10 - 9/17), PRESENTED BY FARMERS INSURANCE GROUP, IS JUNIOR QUARTERBACK, RENO GODFREY! RENO ACCOUNTED FOR 4 TOUCHDOWNS IN THE STALLION FOOTBALL TEAMS 50-6 WIN OVER DAYTON BELMONT! RENO WAS 9 OF 11 PASSING FOR 151 YARDS AND 3 PASSING TOUCHDOWNS. HE ALSO RUSHED FOR 33 YARDS AND 1 RUSHING TOUCHDOWN! THE SECOND EDITION OF THE ST. FRANCIS DESALES FEMALE FALL SPORTS ATHLETE OF THE WEEK (8/27 - 9/1), PRESENTED BY FARMERS INSURANCE GROUP, IS SENIOR DEFENSIVE SPECIALIST, LAINEY MCGONIGLE. LAINEY HAS BECOME AN INTEGRAL PART OF THE STALLION VOLLEYBALL DEFENSE AND HAD MULTIPLE 20 DIG GAMES AGAINST LEAGUE OPPONENTS CSG AND BISHOP READY AS WELL AS AGAINST TOLEDO CENTRAL CATHOLIC AT THE BEST OF OHIO TOURNAMENT! 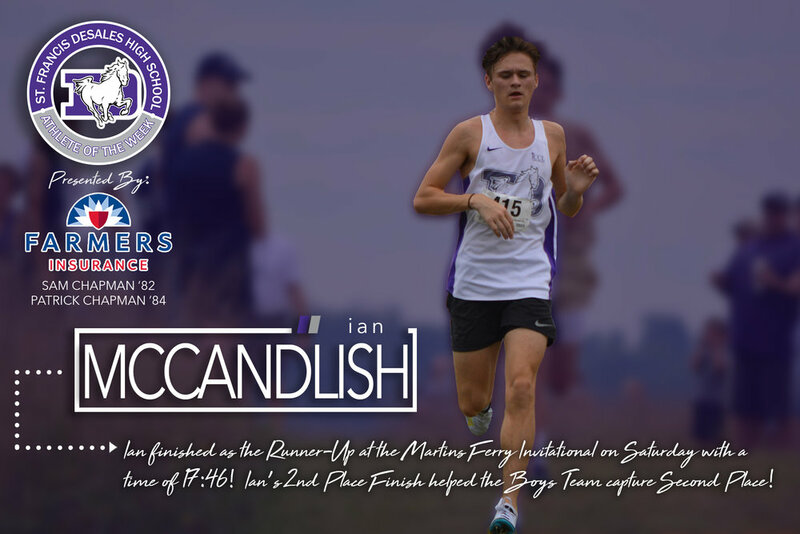 IAN FINISHED AS THE RUNNER-UP AT THE MARTIN'S FERRY INVITATIONAL ON SATURDAY WITH A TIME OF 17:46! HIS SECOND PLACE FINISH HELPED LEAD THE BOYS CROSS COUNTRY TEAM TO A SECOND PLACE TEAM FINISH!